Readers who have been following publishing’s digital transition for two years or more will recall the situation in 2010 when five of publishing’s Big Six switched over from selling their ebooks on wholesale terms, by which the retailer sets the price to the consumer, to agency terms, by which the publisher sets a price that prevails across all retailers. Random House stayed out. That decision seemed to puzzle many observers despite the realities for the publishers. Making the change required actually reducing per-unit revenues to the publisher (and author) while at the same time making each unit more expensive to the consumer, so it was done by what was then called the “Agency Five” at some sacrifice (in their view) for the greater good (in their view) of the industry. Agency protected weaker ebook retailers — Barnes & Noble, Kobo, and Google as well as independents — from having to compete with the deep-pocketed Amazon’s loss-leader pricing strategies. The immediate payoff was the opportunity to sell through Apple’s fledgling iBookstore. Those times are recalled for me by the recent round of indignation and analysis over the jockeying among the retailing competitors over the titles published by Amazon. Everybody is just acting in their own best interest. There really isn’t much mysterious about anybody’s behavior. We could say the most recent set of events was begun by Amazon’s escalating efforts to capture titles for ebook rendering exclusively on the Kindle platform. They were apparently doing this two ways: by signing up authors directly for their own imprints and by offering self-published authors financial incentives — such as paid participation in their lending library program — for making their ebook a Kindle exclusive. For the books they signed directly, Amazon recognized that it might not be the most comfortable sales call in the world for any rep to pitch these books to B&N’s buyers. Representing the books of every bookseller’s biggest competitor would be a challenge but it was one that Houghton Mifflin Harcourt decided to attempt. Last year it was announced that HMH had taken the opportunity to license the Amazon-originated titles in paperback. Major publishers had often expressed the view that publishing in print without ebook rights was a non-starter for them. HMH hoped that their efforts wouldn’t be viewed in that light since it is not considered unusual (although I’m not sure how often it has happened) for ebook rights to remain with the hardcover publisher when paperback rights are licensed. More heat was generated when the Kindle Fire debuted with some graphic novel content delivered exclusively to it. When Barnes & Noble pulled the paper versions of those books off their store shelves, they explained that their policy would be to refuse to stock the print version of something not offered to them for sale “in all formats”. The message at the time seemed clear. If Amazon wanted to sign up books directly and sell them broadly, they couldn’t maintain a Kindle monopoly on those titles. 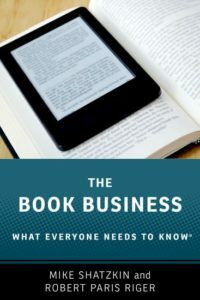 Undoubtedly, it was becoming clearer and clearer to Amazon that getting broader distribution for printed books was an important element if they wanted to sign up important books. Let’s remember that Larry Kirshbaum had been brought on board in June to sign up big titles. He was the first person to work at Amazon who had the relationships and the experience to tell them what it would take to succeed in those efforts. But things were dynamic at B&N as well. With Borders gone, they have become the only player at scale able to offer print book merchandising. There is an increasing awareness of how important print display still is to “making” a book. It is very likely that inside B&N there has been increasing appreciation of the power of their position. There is complementarity here. Amazon had a dominant position with Kindle before the Nook arrived that has been eroding since then due to increased competition. They’re still more than half the ebook sales in the US, but they want to shore up their position. Using their strength to get Kindle exclusives is a sensible way to do that. At the same time, the leverage Barnes & Noble has from its print store dominance is perhaps at its peak. In their case this isn’t because competition in their channel is likely to erode their share. It is a continuation of the consumer trend of shifting to online buying and ebook reading that will dilute the importance of brick-and-mortar even if B&N’s share remains very high. So they too want to use the leverage of that position to strengthen themselves while they can. Both Amazon and B&N demonstrate the power of their position by looking for an increased share of the book sales revenue from publishers. Anyhow, Amazon continued to work on this problem of getting the books they acquired directly from authors into broader store distribution. In January, they expanded the first-look licensing deal they had with HMH and announced the New Harvest imprint there to deliver paperback editions of their books to broader distribution. And, proving they’d been listening to what Barnes & Noble said earlier, they announced that New Harvest books would have ebooks made available in formats that would enable their sale in all ebook channels. It took Barnes & Noble less than a week to respond. Ignoring Amazon’s willingness to make the new imprint books available as ebooks, they instead focused on the continuing programs Amazon had that kept other titles as Kindle exclusives. B&N announced that they wouldn’t carry any Amazon-originated titles in their stores, although they would make them available online and as ebooks. Of course, that “offer” gave Amazon precisely what they didn’t care about (BN.com online sales) or didn’t really want (Nook availability) and denied them what they were really after (bookstore shelf and display space). Pretty quickly, both Daily Finance and Time Business found fault with Barnes & Noble’s move. It was seen as boneheaded for a retailer in the declining brick-and-mortar space to decline to stock some books that might sell. It was even suggested by some that this was an “opening” for Barnes & Noble’s terrestrial competitors to carry attractive Amazon titles, with the implication that this could help them steal customers from B&N. But Barnes & Noble’s competitors actually saw things the same way that B&N did. The independent store and publisher, Melville House, was quickly supportive. A few days later, the Canadian chain Indigo (which occupies the same dominant position there that B&N does in the US) and the second-ranked US chain, Books-A-Million, announced that their policies would mirror B&N’s. The day that B&N announced they wouldn’t carry the Amazon books, a reporter called me for comment. This reporter clearly expected me to castigate B&N for shortsightedness. I think he was surprised when I told him I thought the policy made complete strategic sense for them. The bottom line here is that as Amazon’s power to sign up books away from the major publishers grows, the retailers who depend on publishers for a flow of commercial product suffer along with the publishers. B&N saw — and Indigo and Melville House and Books-a-Million saw — that Amazon wanted bookstore distribution to enable them to sign up more titles directly. Even though those titles would be made available to them, they see themselves as strengthening their enemy when they stock those books. B&N’s decision seems to me like the right move for them. Most very regular bookstore customers aren’t really surprised if any particular store doesn’t have any particular book. Indeed, the impossibility of stocking everything anybody might ask for in a store is part of the reason that online bookselling is such a useful service. In this day and age, most people who want a particular book don’t go to a bookstore to buy it; they just order it online. They go to bookstores to browse and shop and choose from what is within the store. So, yes, there may be some disappointed customers if B&N doesn’t have a high-profile Amazon title, but I don’t think that disappointment will be widespread. On the other hand, authors and agents who might have considered an Amazon publishing deal will have to think twice if they know very few bookstores will carry it. Amazon can do some remarkable things to sell books to their mammoth online customer base and that won’t change. But there is both a practical and a vanity aspect to getting store display that will still be seen as indispensible by many authors and agents who otherwise might have taken the leap to sign with the newest big checkbook in town. Amazon still has the biggest forces, and time, on its side. eBook reading will continue to grow and Kindle will remain the most powerful platform as it does. More and more print buying will shift from stores to online and nobody has mounted meaningful competition to Amazon in the online print channel. The Amazon online experience for search and selection and delivery remains — in this consumer’s opinion — far and away the best. Their reach beyond books to so many other product lines gives them further advantages in many ways, including fueling their Amazon Prime program, which is an unmatched tool to encourage customer loyalty. The shelf space for books at B&N will almost certainly continue to decline and the leverage that comes along with it will do the same. This tactical decision will not change the overall course of history. Neither did Random House’s decision to postpone moving to agency for a year after everybody else did. But, just like Random House’s decision, everything Amazon and Barnes & Noble (and the retailers that followed them) have done is actually perfectly sensible when viewed from the perspective of their own self-interest. There are a lot of smart people engaged in a pitched battle here. Outside observers would be well-advised to keep that in mind as they evaluate the moves they make.